There are many temples in Siem Reap, each one unique and worth a visit. Some temples are within a few minutes of the other so it makes good sense to view them on the same day. I saw Pre Rup from across a rice field on our way to Banteay Srei. 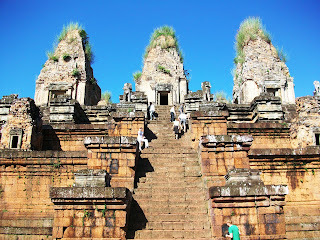 This was such a pleasant surprise that I begged my guide and tuk tuk driver to let me explore the ruins. In this temple we can see the pyramid style of construction crowned by five lotus towers (in this photo you only see three). Farther afield is Banteay Samré which is one of the least crowded temples we visited. There's a pleasant walk between tall trees leading up to the walled temple grounds. Unlike Banteay Srei where you can only walk around the perimeter of the temples, at Banteay Samré we could enter the central temple. It is bare now but once upon a time within this hallowed walls, only the high priests or Brahmin were allowed entry.